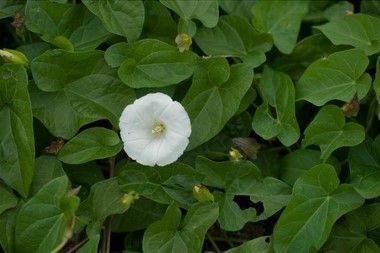 Bindweed (also known as Convolvulus Arvensis) is one of the more common perenial climbing/creeping weeds. This destructive weed is known for its ability to smother incumbent garden plants and overwhelm borders in as little as 2-4 months. Their roots can reach 7 metres deep and can grow aggressively, as any gardener that has had the displeasure of having it grow in their garden would know. Bindweed is often called wild morning glory as it shares visual similarities with ‘morning glory’. Those include a thin stem, the elongated leaves shaped like ‘arrowheads’ and the trumpet-shaped flowers that appear in both pink and white. The first signs of the bindweed are usually the thin vines becoming tightly entangled with other plants or other rising objects in the garden. The bindweed seed able to lie dormant in the soil for many years, new plants can grow from even the smallest section of root (rhizome). Bindweed root fragments are often unwittingly brought into to the garden amongst the roots of other plants or in soils and manures. Once bindweed is present it only takes a single growing season for it to spread two metres across.